If money is the root of all evil, then is barter the root of all not-evil? 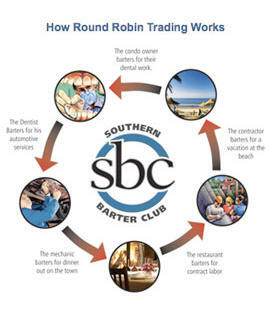 Find out, at Southern Barter Club. Started in February and already boasting 1,000+ Georgia members and 50k+ worldwide, SBC facilitates the swapping of anything deemed valuable -- goods, services, talent, amusing lack of talent -- by both individuals and businesses, either through direct trade or through accrued "trade dollars", recognized by both the IRS and the even more feared International Barter Alliance. The direct route's the online auction, where members bid for goods/services/etc with offerings of their own; past deals have involved five-star hotel accommodations, fancy dinners, furniture, and even a motorcycle handed out in exchange for handyman'ing, web design, etc, while SBC's president actually secured her daughter's private schooling in exchange for legal aid in collecting unpaid debts -- which private schooling would tell you is ironic. Probably. Then there's the online market: establish your offering's value (outlandish sums are further vetted), and interested members will post trade dollars to your online account, for you to blow on whatever's out there: direct mail advertising, commercial landscaping, virtual assistants, residential cleaning, travel arrangements, event tickets, health club memberships, tennis lessons, time-shares, Oriental rugs, electronics and, because value is in the eye of the barterer...donuts. If a needed service or item isn't available, you can add it to a "wanted items" list, and SBC will send an automated e-mail when it hits the market -- though at this point you might just go ahead and use cash, because while money is the root of all evil, sitting around waiting is its stupid, exhausting plant.